he Olympic College Foundation has won five 2019 communications awards from CASE District VIII, including Silver for magazine improvement and fundraising publications. 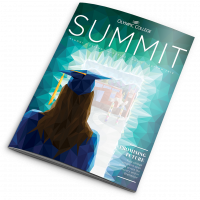 The award for magazine improvement recognizes the rapid transformation that Summit, OC’s alumni and friends magazine, has undergone in just three years. The first issue was a 4-page newsletter published in September 2015. Now 32 pages, the magazine has evolved into an engaging read with stand-out design and photography. Also winning a silver award was The Campaign for OC: The Place, The Programs, The Promise, the case statement for the Foundation’s $5-million fundraising campaign. The 16-page booklet uses student stories to demonstrate the need for equipping the new College Instruction Center, funding programs to help all students succeed, and providing one free year at OC for regional high school graduates through the OC Promise. “These awards are especially impressive because OC is competing and holding its own against world-class schools like the University of Washington, which have much larger budgets and staffs,” said Foundation Executive Director David Emmons. CASE, which stands for Council for Advancement and Support of Education, is an international organization. District VIII includes more than 150 colleges and universities in Alaska, Idaho, Montana, Oregon, Washington and Western Canada. Magazine Cover Design: Master Weaver, Summit – The cover features a photograph by Logan Westom Photography of Port Gamble S’Klallam Elder Darlene Peters wearing a ceremonial robe she helped weave. The robe is part of the permanent collection in the Burke Museum and the photo shows Peters reflected in a display case at the Burke that holds a similar but much older robe, underscoring her connection to tribal tradition. Annual or Biennial Reports: Transforming Lives, Olympic College Biennial Community Report 2015-17 – The report provides a snapshot of the impact of OC and the Foundation. It also features a student impact story about Josh, who in two years went from being homeless to being on the path to a high-demand career in welding with help from the community, the college and the Foundation. Electronic Newsletters: The Lookout – The bi-weekly E-News began publishing in April 2018 to keep alumni and friends up-to-date on news and events in and around campus. Sign up here.